Cookware is an absolute necessity in every kitchen. However, quality cookware can be expensive, and it’s hard to know which brands, material, and types are best. This buying guide will cover some of our top picks for cookware based on price and material to help you narrow down your selection. We’ll also take a look at some of the considerations that go into buying cookware, including material, stove types, and more. This brand-new brand has impressed us right off the bat, so we’re pleased to include them as our favorite set overall. 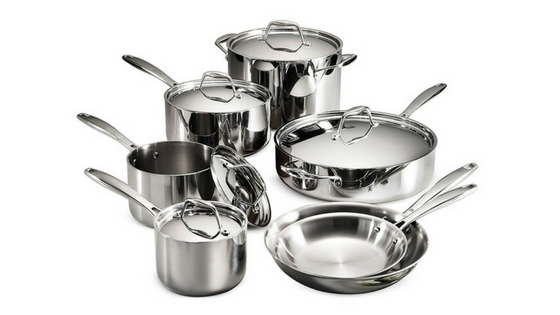 This is a 5-ply, fully-cladded stainless set has “family-size” pieces that work perfectly for versatile cooking. It’s beautiful brushed stainless that is oven-safe and compatible with induction cooktops. For a set that will last a lifetime and take on any task you throw at it, grab a Kitchara stainless set. This All-Clad set takes a top spot for best overall cookware set for a number of reasons. First, it’s well under $1000, which, considering how much top quality cookware can be, is still a great deal. It is also optimized for induction, is dishwasher safe, and is constructed with attention to detail. It heats evenly, stands up to daily use, and is even oven safe up to 600 degrees! When you’re ready to drop the cash on a cookware set that will last you years to come, you really can’t go wrong with an All-Clad stainless set. 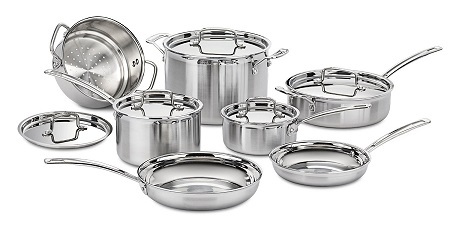 At around $300, this 18/10, induction-ready, dishwasher safe stainless set gives you a useful collection of premium pots and pans at a fair price. It’s worth the investment and makes a great upgrade set for home cooks who want to improve their cooking skills. Tramontina offers a lifetime warranty, so you can feel good about the money you’re putting into it. As you’ve probably guessed, spending more on cookware means getting higher quality. However, being on a limited budget doesn’t mean you have to skimp on quality completely. While you might consider purchasing cookware pieces as your financial situation allows in order to get better quality, there are still some budget-friendly sets that should last you for a while at least. This T-fal set has a lot going for it: It comes in a variety of colors, it includes two pan sizes with lids and three pots with lids, and it’s under $100. In fact, the list price is under $80, but it’s easy to find various colors on sale for much less. It’s a good starter set for young adults as it has the main pots and pans you need for most meals. The T-fal Excite set is durable and dishwasher safe, so it should last a while. When you bump your price range up to $200, you start to get even more options that are pretty good in terms of quality. At this price point you’ll also want to think beyond nonstick – there are some quality stainless sets in this range as well. 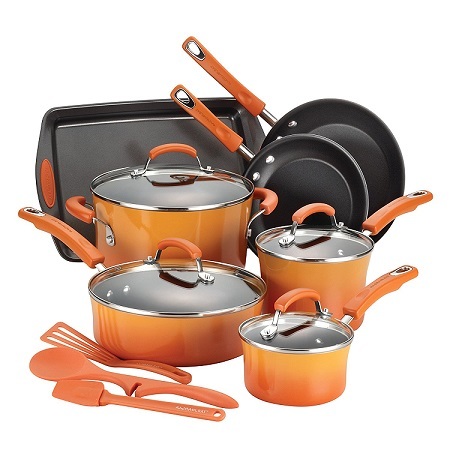 However, our pick for best set under $200 is this nonstick set from Rachael Ray. It comes in some fun color options, includes four pots, two pans, and bakeware, and is durable. Do be advised beforehand, though: the pots and pans should be hand-washed. Again, bumping up your price point gives you plenty of options in cookware sets. The Under $300 crowd is strong, and it’s tough to choose a favorite. 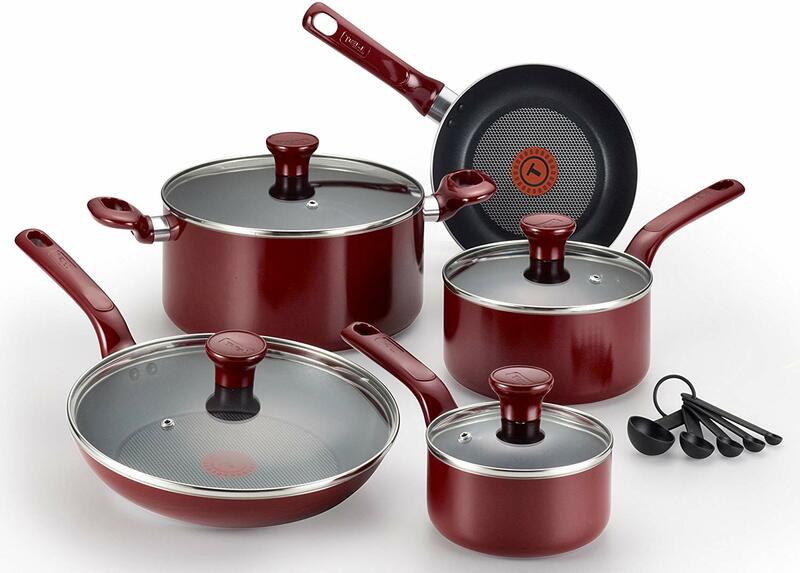 However, this 12-piece set comes with useful sizes in pots and pans, and it’s durable and dishwasher safe. Priced well under $300 (and just over $200 if you can catch them on sale), this is a cost effective set that will last you quite a while. Additionally they are aesthetically pleasing, with a black matte finish on the outside that looks like a major upgrade from your first apartment’s mismatched set. In the under $500, you have a lot more options, and it’s pretty much a given that you’ll get a good set. Even so, some sets are better than others, so we recommend sticking to a well-known brand with consistently high reviews in order to get the best set possible. We have a few recommended sets for under $500. First, this All-Clad 10-piece set made of hard-anodized aluminum has a list price of $700 but is often on sale for under $500. All-Clad is one of the most highly regarded cookware brands, so this is an excellent deal if you can catch it at the right time. These pieces are well designed, oven safe up to 500 degrees, and are dishwasher safe. A set from All-Clad will be long lasting and make you feel like a pro. 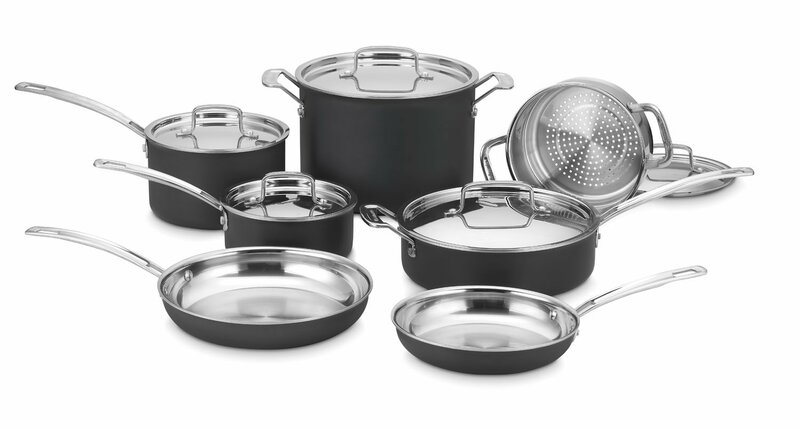 Another great option from a well-known name is this 12-piece hard-anodized aluminum nonstick set from Calphalon for under $400. Calphalon is a top name in cookware but runs a bit less expensive than All-Clad, so you’ll save a bit on this set. This 10-piece Diamond Plus cookware set from German-based Woll is just under $500 and is a third option in this price point. The set is lightweight, dishwasher safe, and oven safe to 500 degrees. 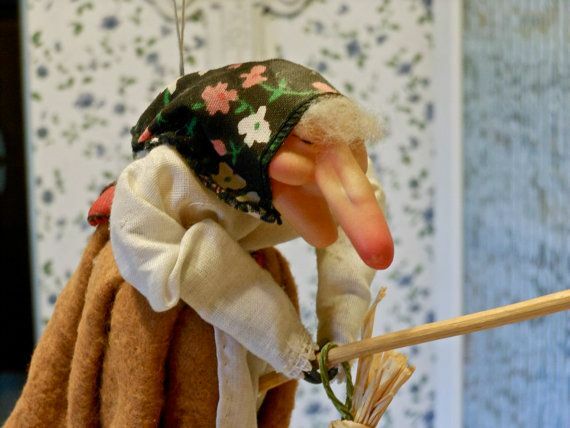 The long handles are a big perk, and Woll guarantees that their engineering prohibits blisters, bubbling, and peeling. We like this Cuisinart set for its affordability (often on sale for under $200) and its versatility. It works with induction cook tops, and it comes with practically everything you need to cook every day. Each piece is both dishwasher safe and oven safe up to 500 degrees. Use Bar Keepers Friend to keep it looking great. Best Set Made in the U.S.A. 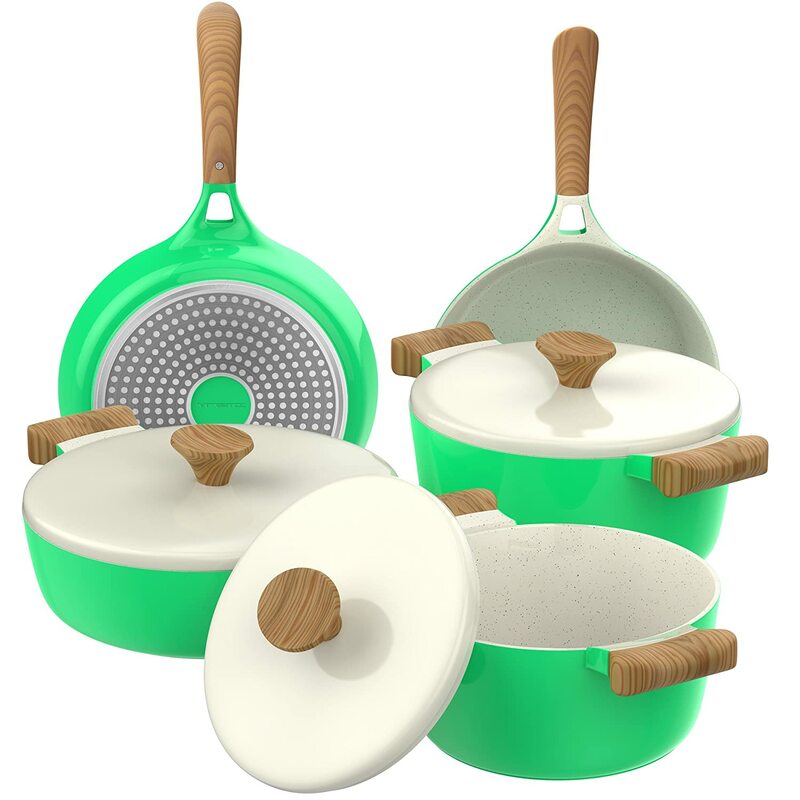 Newcomer Made In is an exciting brand that sells American-made cookware directly to consumers. This means you get premium stainless steel cookware at a lower price point, and you’re buying straight from the manufacturer. This particular set is also worth your attention because it includes a nonstick pan with the stainless set — most stainless steel cooks need a nonstick for the occasional item, so this is a fantastic addition. The Core set has 7 pieces (including 2 lids), is induction ready and dishwasher safe, and is oven safe to 660 degrees. Finding good nonstick cookware is tricky because poorly made or cheap nonstick ruins easily and chips quickly. This Calaphon set lets you use even metal utensils and it is oven safe to 500 degrees. They are also dishwasher safe. 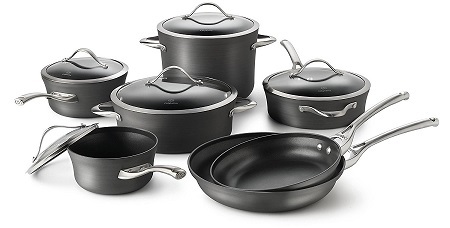 The tri-ply, 12-piece set includes 10- and 12-inch omelette pans, 1 1/2- and 2 1/2-quart saucepans with lids, 3-quart saute pan with lid, 5-quart dutch oven with lid, and 8-quart stock pot with lid. All have stainless handles that stay cool to the touch while cooking. This set is an incredible deal for anyone looking for a nonstick set that performs like stainless. Good copper cookware costs a pretty penny. There are, of course, plenty of cheaper versions out there, but to get a true copper set you have to spend a bit more. One surefire way to ensure you’re getting the best for your money is to stick to a trusted name. Our top pick for copper is Mauviel, and this 5-piece set is a great way to get a few pieces you’ll use frequently without paying too much for a larger set you won’t use. This set includes a 1.9-quart saucepan, 3.2-quart sauté pan, and a 10.2-inch skillet. Mauviel is highly rated and well received across the globe for their copper cookware, and they have a lifetime warranty. If you are interested in making the leap to ceramic cookware, this is an excellent set to start with. Vremi’s nonstick 8 piece set has an aluminum base, so they are actually fairly lightweight. The cookware works on induction, gas, electric, or halogen stovetops. They are easy to clean and even dishwasher safe. You can use any of the pieces in the oven up to 500 degrees. Cookware is an investment, even if you’re looking for a cheaper set. Make sure you’re getting the most out of your investment by doing research and taking stock of what you have before you buy. There are definite advantages to buying pieces rather than full sets, so you might consider going that route if you have some go-to pots and pans already, or if you want to build your stock with top quality cookware. The advantage of buying a set, however, is that you can get everything you need all at one time, everything will fit together, and you’ll have a matching set. If you are replacing an old set, are just starting out, or moving to a different material, a set is a great way to do this. While it might seem like the best way to purchase a set is to get the highest number of pieces for your budget, that’s not always the case. Oftentimes, buying a smaller set is fine – you can get the pots and pan sizes you’ll typically use – and you can stretch your budget by getting a higher quality name brand. 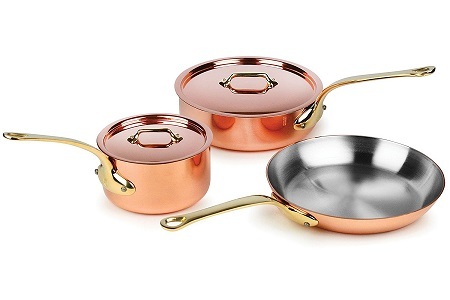 For example, our best copper pick above only includes 3 pots and pans, but you’re getting a super high quality brand. Another approach is to buy fewer pieces to start out and add single pieces as your budget allows. The point is, don’t simply buy a set because it has the most pieces – buy the set that has the sizes and pieces you need and is the best quality possible within your budget. It’s also a good idea to see exactly what the pieces are before you buy. Some large sets might sound like a lot, but in reality they have separate lids for every single pot and pan. If you’re short on cabinet space, this can be a real problem. In many cases, it might be worth it to find a set that has lids that fit more than one piece. Understanding your needs and habits in the kitchen is an important way to narrow down the selection and ensure you get the right cookware. Your skill level is an easy place to start. If you are new to cooking a stainless set might not be best for you – scrambled and fried eggs are basically impossible unless you’ve got skills. And copper is a bit tricky for novices because they shouldn’t be used for certain foods or in certain ways. Your cooking style and favorite foods to cook are other factors to keep in mind. If you want something that will give meat a good sear, you’ll need stainless steel. Like to finish in the oven? Make sure you get something that is oven proof up to 500 degrees. You’ll see that most cookware sets have approximately the same size pots and pans. You’ll have to pick up specialty sizes (like woks and crepe pans), bakeware, and specialty materials like cast iron in pieces (usually), but you should be able to get the basic sizes your kitchen needs for everyday cooking from your cookware set. It’s critical that you check on the included pieces before you buy – you don’t want to pay all that money and not get the stockpot or skillet that you use the most. Nonstick cookware is among the most popular on the market, though it has a bit of a shady reputation. Let’s address the bad stuff first. Nonstick cookware has come under fire for being unsafe – various reports claimed that the coating is toxic. The latest research shows that nonstick pots and pans are perfectly safe – as long as they are not overheated. This means a few things: you don’t want to preheat the pan (either empty or with oil), and the cheaper the pan, the faster it will overheat. For convenience, fat reduction, and affordability, nonstick can’t be beat. Nonstick cookware allows you to use less butter, oil, and other fats that are typically needed to prevent food from sticking. It’s also easy to clean because food is less likely to stick to the pan. And, nonstick is usually the least expensive of the options out there. 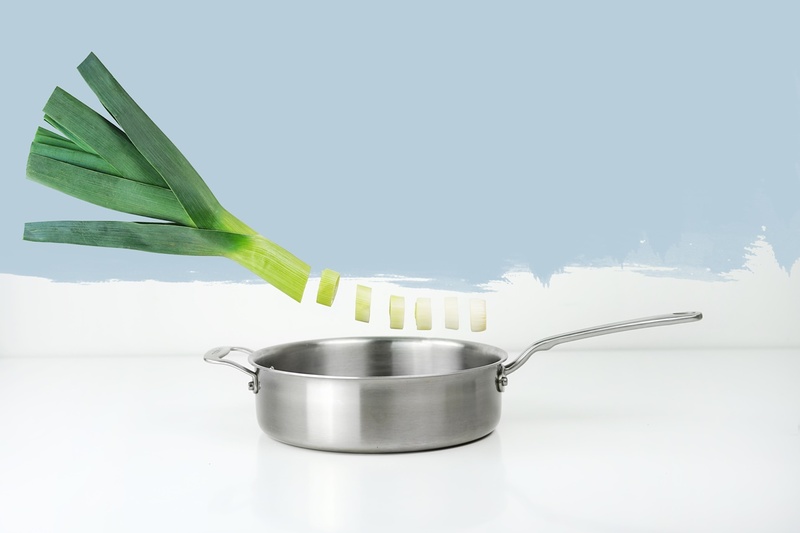 Nonstick pans are typically made from other material – such as aluminum or stainless steel – and coated with nonstick material – Teflon is the most common. Though some newer (and potentially more eco-friendly) nonstick materials are becoming more popular, most still use Teflon. No matter who you are, chances are good that you’ll want to have at least one nonstick pan on hand – it’s a must for dishes like eggs and fish. Some are oven safe, but be sure to check the manufacturer’s info to be sure. Some also may require (or benefit from) handwashing, so if that’s something you don’t want to do at all, check both manufacturer’s guidelines and user reviews. Dishwashers can be hard on nonstick cookware and can cause the coating to flake off sometimes. Never use abrasive cleaners, like steel wool, on your nonstick pans. Not to be outdone, stainless steel cookware gives nonstick a run for its money in the popularity department. In fact, many home cooks choose stainless when they’re ready to upgrade from their first set of nonstick (or from the haphazardly put together lineup of mismatched cookware). Stainless offers some great perks for cooks. It’s durable – it won’t chip or peel like nonstick, and it typically lasts much longer. However, it takes time to learn to cook with stainless steel, and some cooks find that seasoning the pan makes a huge difference. Using stainless steel cookware lets you get a great sear on meat and it’s usually safe to put in the oven, so you can get a great finish on your dish. You do need to get the pan hot before putting the food in so it doesn’t stick. You also need to take extra measures for cleaning in some cases. Stainless can be a poor heat conductor on its own, so many cooks choose to find a cookware set that has a layer of copper or aluminum. When shopping for stainless steel cookware, one key feature to look for is the number of layers it has. Tri-ply is fine when you’re looking for an affordable option. Additionally, it’s good to get to know stainless – do a little research (and watch for more articles here!) about reactivity, how acids can affect stainless, and how to treat your stainless steel cookware. There’s a lot to love about stainless, but there’s also a lot to know in order to maximize your stainless cooking experience. Copper’s beauty and often misunderstood nature makes it appear in many kitchens as decorations only. It’s often expensive and can be tricky to cook with, so it is usually favored by more seasoned cooks. However, there are many benefits to cooking with copper cookware, so it’s worth the time to get to know copper if you’re interested in making an investment. Copper is amazing to cook with for a few reasons. First, it’s an excellent heat conductor (the best, in fact), making it easy to cook evenly every time. It also heats up and cools down quickly; its sensitivity is useful for recipes that require precision in heating and cooling. It does not work with induction cooktops, however, so avoid this material if you have an induction range. It is best to get thicker, heavy gauge copper for your cookware to avoid disfigurement. You’ll also want to make sure to only hand wash (and regularly polish) the cookware. You will see two different design styles – smooth and hammered. In the past a hammered finish indicated quality, but today it is simply a style choice (so don’t be tricked into paying more just for that finish). It’s often a good idea to buy copper cookware in pieces first, especially if you are new to copper. This will give you a chance to see if it work for you without spending a fortune. Copper cookware is beautiful and functional and worth your time and consideration if you are an experienced cook who wants to elevate your cooking skills. There is a lot of contention around aluminum cookware, yet it’s the most widely used material. You’ll hear things about poisoning from aluminum, or that it easily warps, or that you can’t use it on certain types of stoves. This all has roots in some truths, but there’s a lot to know about aluminum beyond the rumors. Aluminum is an excellent conductor, so it cooks quickly and evenly. The majority of aluminum cookware is not just straight aluminum; that is, your food isn’t in contact with the metal. Aluminum cookware is coated or anodized, or it is inside other materials to act as a conductor. There is some plain aluminum cookware (very rare), but even that hasn’t been proven to pose a major health risk in using it. It can warp, which makes it unsuitable for flattop stoves. Over time, the coating can wear away, so it isn’t cookware that will last a lifetime. It’s also reactive to acidic foods – this affects the taste, and some cooks find this to be a major issue and will opt for other cookware for those foods. Chances are you’ll have some kind of aluminum cookware in your lifetime. It’s good to know the facts and do a bit of research on the cookware itself so you can be sure it will work best for your cooking needs, and so that you feel comfortable with the material itself. Aluminum is not bad, but there are some things to understand about it – just make sure that you buy coated or anodized aluminum to reduce any risks and replace the pots and pans when they start to wear away. Ceramic is a type of nonstick cookware that isn’t super common, but that is growing in popularity for a number of reasons. First, it’s a more environmentally friendly option for nonstick in a number of ways. It’s also thought to be safer than other materials (such as Teflon) because it is free from chemicals. It’s also a rock star when it comes to handling heat – ceramic can withstand much higher temperatures than other nonstick. Many ceramic cookware pieces and sets are sturdy and will last a long time. Cast iron makes an excellent to any cook’s kitchen, but it’s usually impractical to pick up more than one or two pieces: a skillet and an enameled Dutch oven are staples, but it’s rare to see many more pieces than that. We’ll cover cast iron cookware in a later post, so stay tuned. A final component of your cookware decision should be your stove type. Some stove tops require certain material or are not compatible with others. Always check with your stove’s manufacturer to ensure you are buying the correct cookware for your stove to prevent any damage. We’ll talk briefly about some general guidelines. Induction stovetops are some of the most finicky. Induction requires magnetic cookware that has a flat bottom. Stainless is the most common, though cast iron will also work on induction stoves. Some aluminum and copper brands will work, but check for magnetism before you buy (and, again, double check with the manufacturer). For glass top stoves, your main priority should be getting cookware that is fairly heavy and has a flat bottom with no ridges. Most cookware should work okay for flat top stoves, but for better heating and cooking you should ensure you’re getting the best fit. What do you recommend for a Gas top stove? You can technically use any material on a gas stove top, but stainless would be your best bet. I’d recommend picking up whatever stainless set you like best (and fits your budget) and then add on a good nonstick frying pan (I’m partial to the All Clad nonstick, but you can find all my picks here: https://www.thekitchenwitches.com/best-skillets/). which one would you recommend the most for a beginner to use?